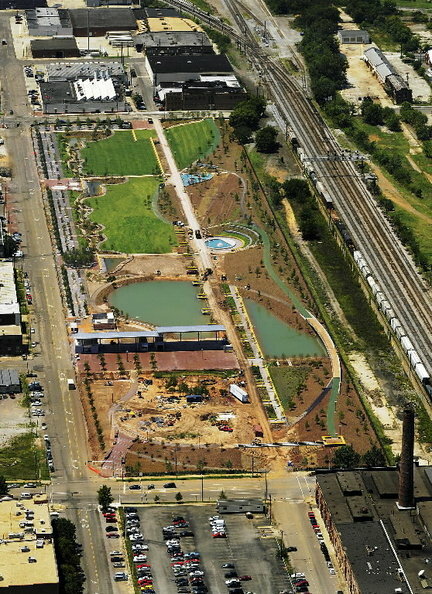 Birmingham's Railroad Park to open in September | al.com: Downtown Birmingham's new $25 million Railroad Park will open to the public Sept. 18, after decades of dreaming and a year and a half spent transforming a vacant, weedy lot into a rolling landscape of flowers and trees, lakes, streams and green lawns. Envisioned as a green magnet to draw those who live and work downtown and at the University of Alabama at Birmingham, the project aims to create an outdoor "living room for the city." "This is a 20-year dream for the city of Birmingham," said Mayor William Bell. "It makes a statement that we are a city of the 21st century. We are giving homage to the past and celebrating our future."